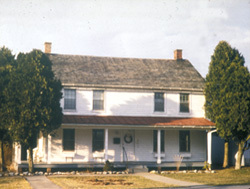 Harriet Tubman (1822-1913), a renowned leader in the Underground Railroad movement, established the Home for the Aged in 1908. Born into slavery in Dorchester County, Maryland, Tubman gained her freedom in 1849 when she escaped to Philadelphia. In Philadelphia, Tubman made connections and found support among other white and black abolitionists. Although Harriet Tubman found her freedom, she was separated from her family. Between 1850 and 1860, Tubman returned to the Eastern Shore of Maryland 13 times and freed more than 70 people, who were her family and friends so they can all be free together as a family. Maryland planters offered a $100 reward for Tubman's capture at one point during her time as an Underground Railroad conductor. Active during the Civil War, Tubman assisted the Union Army as a spy, nurse, cook, and guide. From Port Royal, South Carolina, in June of 1863, she aided a detachment of 150 African Americans in a raid up the Combahee River, destroying Confederate mines, storehouses and crops, and liberating about 800 slaves. Dedicating her life after the Civil War to helping former slaves, especially children and the elderly, Tubman also became active in the women's rights movement and the AME Zion Church. In 1859 Tubman contracted for seven acres of land and a house from Governor William H. Seward in Auburn, New York, for which she had lenient terms of repayment. It was to this property that she brought her parents after their intial stay in Canada, and where they stayed while she was assisting Union troops during the Civil War. After the war she returned to her home in Auburn and began what was to be her life-long work of caring for aged and indigent African Americans. She supported the construction of the Thompson AME Zion Church in 1891. In 1896, Harriet purchased 25 adjoining acres to her home on which stood the building now known as the Home for Aged. 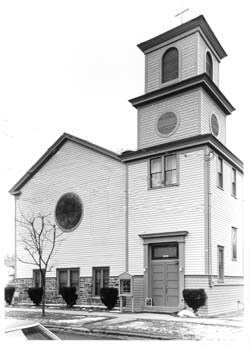 Here she struggled to care for her charges, and in 1903 deeded the property to the AME Zion Church with the understanding that the church would continue to run the Home. 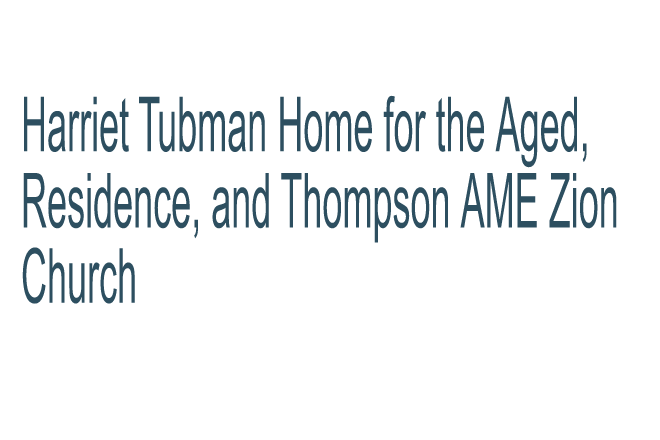 Tubman continued to live at her home, until her own health deterioted and she was cared for at the Home for the Aged. She died there in 1913 at the age of 92 or 93 and was laid in state at the Thompson AME Zion Church. Though not directly associated with Tubman's activities with the Underground Railroad, these properties, designated a National Historic Landmark, are a tangible link to this brave and remarkable woman who is known as "the Moses of her people."